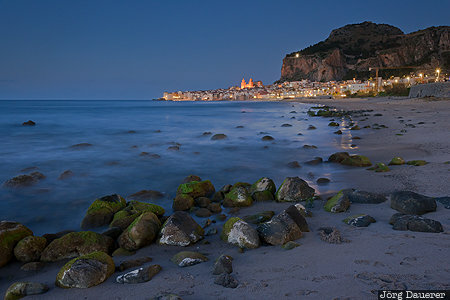 The beach of the Mediterranean sea near Cefalù and the flood-lit city dominated by its cathedral in the background seen at the blue hour after sunset. Cefalù is in the north of the Mediterranean island of Sicily, Italy. This photo was taken in the evening of a sunny day in March of 2017. This photo is part of the exhibition The Beach (June 2015). This photo was taken with a digital camera.